home Amanda Brown (USA) paints “junk spaces” (urban places with no pretention or specific function) using photos as a starting point. At Marmeleira she was inspired by the vegetation around the house. 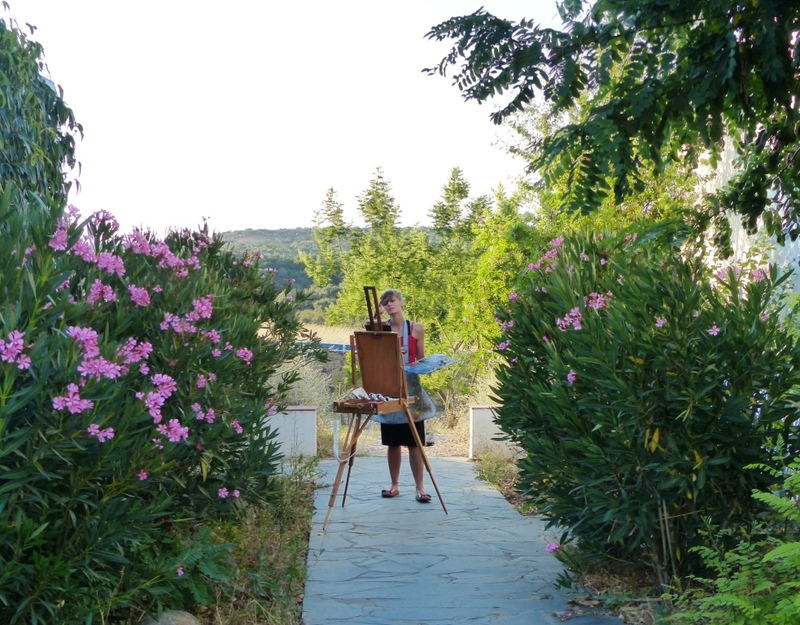 She decided to paint en plein air the light on walls and vegetation in the beginning and end of the day, which resulted in a wonderful series of small paintings. Nearly 25 years ago Kevin Tolman (USA) lived for one year in Portugal. Since then he comes every few years. He works abstract and intuitively. He tries to catch his perception of Portugal by painting layer over layer over layer. Some layers are recognizable: a piece of an old newspaper or a part of a cloth. Other layers have been largely overpainted. This is how he perceives Portugal: the result of many events in history: some are still evident, while others are invisible but also contribute to what we currently experience. Hester de Beus (Holland) is inspired by Rudolf Steiner and his philosophies on the duality in life represented by fire and earth. With dead branches of a native shrub: Esteva (Cistus Ladanifer) Hester made a sculpture dedicated to fire. And after having seen Rivers and Tides, a documentary on Andy Goldworthy she made meandering lines of flat slate stones. First "at home" and later in the landscape about 15 minutes walk from home. She entitled that one: UPSTREAM. Carmelo Midili (Italy, living in USA) generally makes sculptures in which he integrates recycled material, not only the lids of plastic bottles but also drafts for paintings that he finds in the garbage container of his arts department. Until now he had a large studio, which allows him to work big. But soon his studio will be demolished (including the art works that cannot easily be replaced!). This is why he wants to concentrate more on photo and video. He was intrigued by slow motion in marble quarries (sowing the marble, lifting by cranes, pushing by bulldozers and so on) and decided to make a video of it. Cyane Tornazky (USA) mixed digital art with painting. Among others she designed a cobweb with in its centre a hole. It refers to her feelings on an artistic residency: by leaving city life with its bombardment of triggers she feels to step into a parallel world with fertile ground for inspiration and creativity. Susan Fang (Taiwan, living in New York) made photos, collages and prints on textile, all black-and-white, on fear for the unknown. Spooky and intriguing in the same time. Jan van IJzendoorn (Holland) generally makes art works for public spaces, but he used his residency to work on a private commission: a bronze sculpture of a sun dial, consisting of a hare sitting on a turtle (thereby referring to the antique tale by the Greek Aesopus (6th century bC). The hare carries an umbrella of which the shadows of the ribs will indicate the hours of the day. 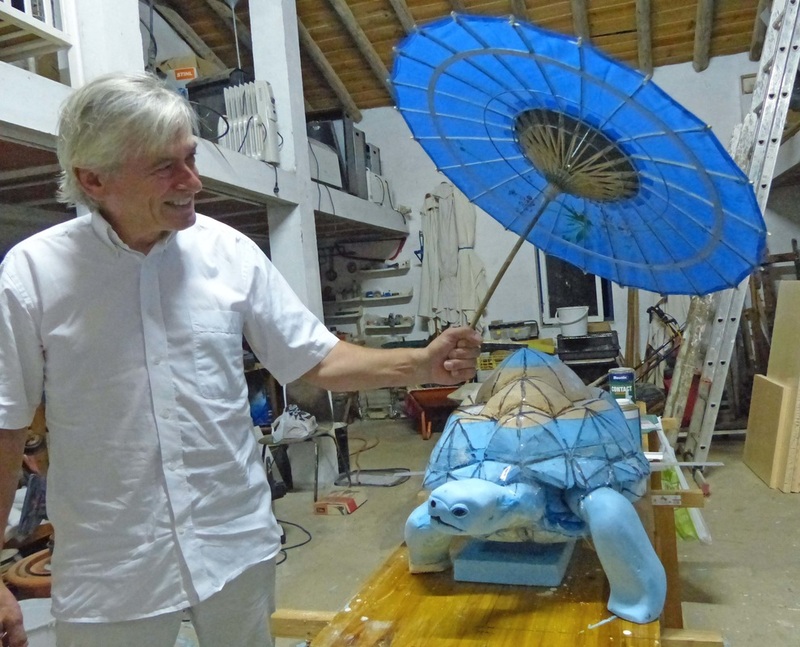 It took three weeks to make a mold for the turtle and the umbrella; the hare will come later. Gerrie van der Linden (Holland) came back twice in 2014. 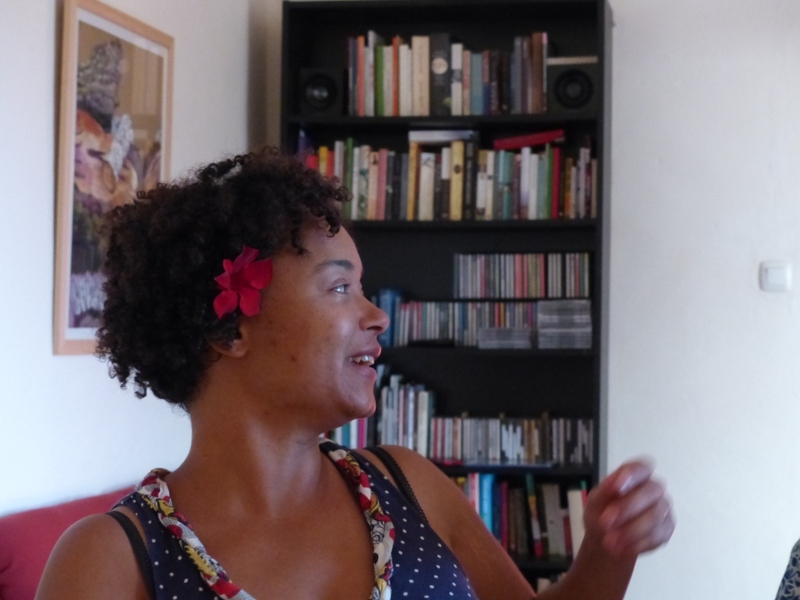 Her latest anthology (published in 2013) contained eight poems on Portugal. The next will be entirely about her Portuguese experience and will become bi-lingual (Nl and Pt) and contains a photo documentary by Luís Branco of objects that she found or created with materials around her cottage. These objects are like her poems: intriguing, seemingly narrative and with a gentle touch of humor. 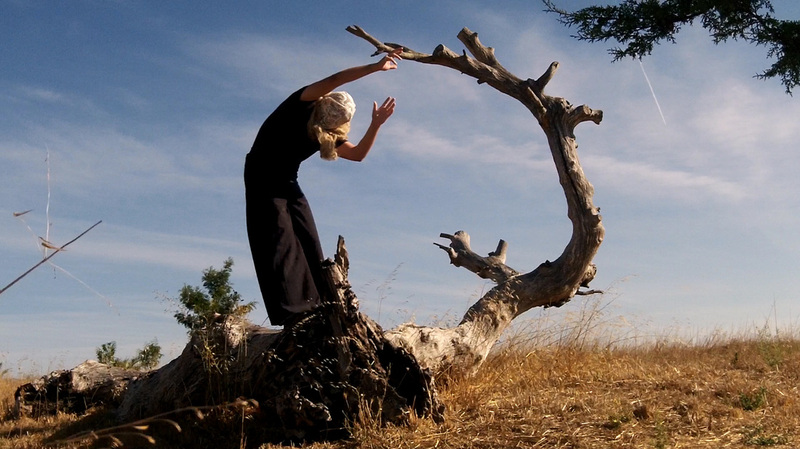 She plays with form and content, using water, fire and landscape as metaphors for life. She also started a collaboration with another resident: Johanna Lane, that may lead to a joint publication in 2016. From the first until the last day of her residency Kimberly Trowbridge (USA) appeared to have infinitive sources on energy and creativity. Yet, she gave full attention to both the general atmosphere and the application of colors. She mainly painted, but also experimented with video and shadow play. Being inspired by French impressionists such as Cezanne and Matisse, she often paints paradisaical landscapes and dancing nudes. Her paintings, drawings and videos are full of emotion and sensuality. One of the many projects Kimberly was working on during her September residency was designing the installation "Physical Memory". It is now presented on the 3rd BAM Biennial "Knock on Wood" in Bellevue Art Museum, Seattle, USA. Dasha Sitnikova (Russia) uses paper tubes and light to get shadow lines and 3d forms. The work investigates relations of the human being with its surroundings, and playfully refers to Bauhaus, El Lissitzky and Mondriaan. 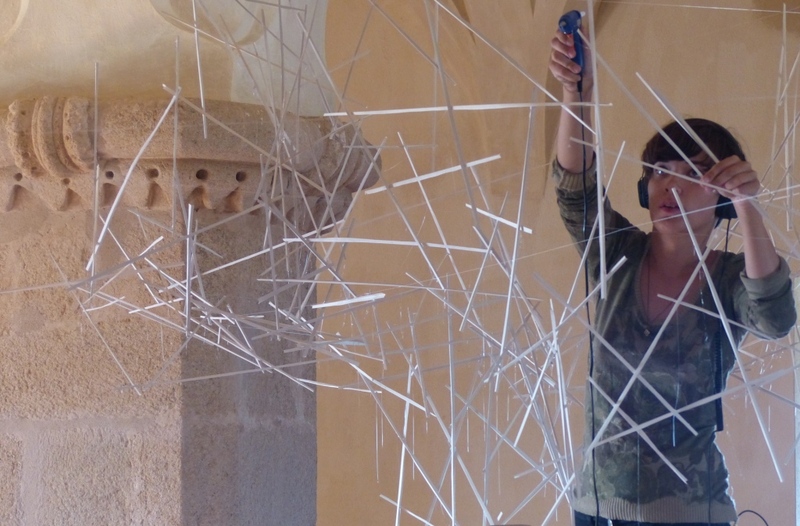 She accepted the challenging invitation to make an installation in the Castle of Evoramonte. Proximidade (proximidade, близость) is the name of this art installation. 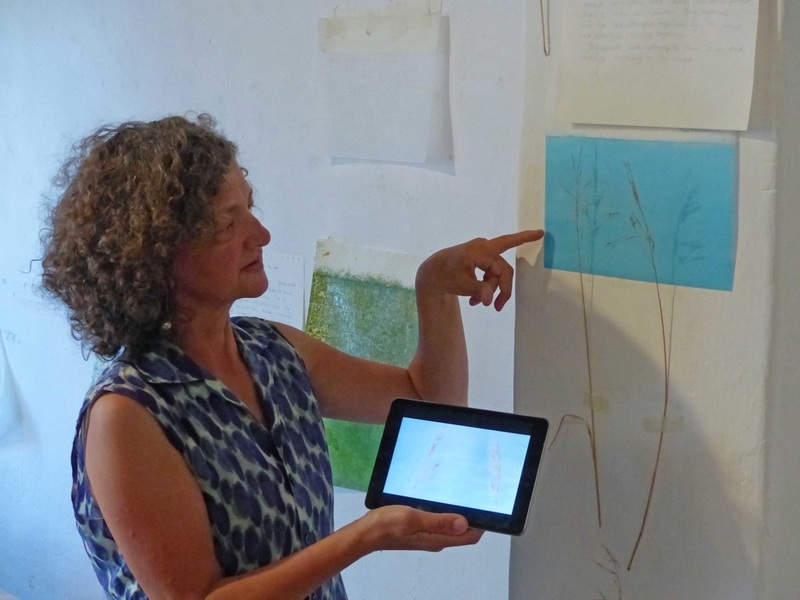 Sandra Gregson (Canada) was making sketches and videos using local materials, but basically she was doing conceptual studies on time: on “the moment”, “timelessness”, vanity and so on. Eugenia Gortchakova (Russia) is working on Alternité: a documentation of responses of persons after having set up a hat that refers to a certain culture or status (fur hat, turban, military cap, burka, grandma´s hat). Another ongoing project got Evoramonte as a working title: a seemingly simple, but highly intriguing geometric line drawing, that gives the spectator a gentle feeling of disorientation and timelessness. Julia Morrisroe (USA) is a passionate painter, but a deeper layer is to contemplate on “what is a painting? How has, does, will a painting shift, open or even close for me?” She considers that in recent decades all information has become equal and connected, and our visual stimuli largely lost hierarchy. This transcends the boundaries of any one painting. With these considerations in mind Julia made abstractions of her impressions of the surrounding nature. Susan Fang (Taiwan, living in New York) made photos, collages and prints on textile, all black-and-white, on fear for the unknown. Spooky and intriguing in the same time. Alexander Keyes (USA) worked on his fascination for the sea, partly as a carrier of ships and a house for mythical animals, but partly also as a metaphor for beauty, infinity and the unknown. But during his residency he also started a completely different project. He is creating an enterprise: AK Industries, that does not produce anything: its only content is the brand. Alexander is now preparing to launch a PR campaign with posters, business cards, public presentations and so on. Vibe Overgaard (Denmark) came to collect video material for an installation in which ruins play a central role. During her surveys in the surroundings she found a second fascination: marble quarries. She gave in impressive artist talk, in which she showed her recent work: mainly installations inspired by the way movies communicate with the viewer. Overgaard (Denmark) made series of photos at night in the marble quarries:both mysterious and impressive.made videos that she projected on a marble sheet as part of a small installation. AIANDO was a multidisciplinary project (performance, visual and sound installations) Nuno Veiga and Melina Peña developed and presented on 22 August in the Castle of Evoramonte. Nuno Veiga is a Portuguese actor and sound artist, currently living in London. Melina Peña is a Mexican dancer, performer and visual artist, currently living in Barcelona. 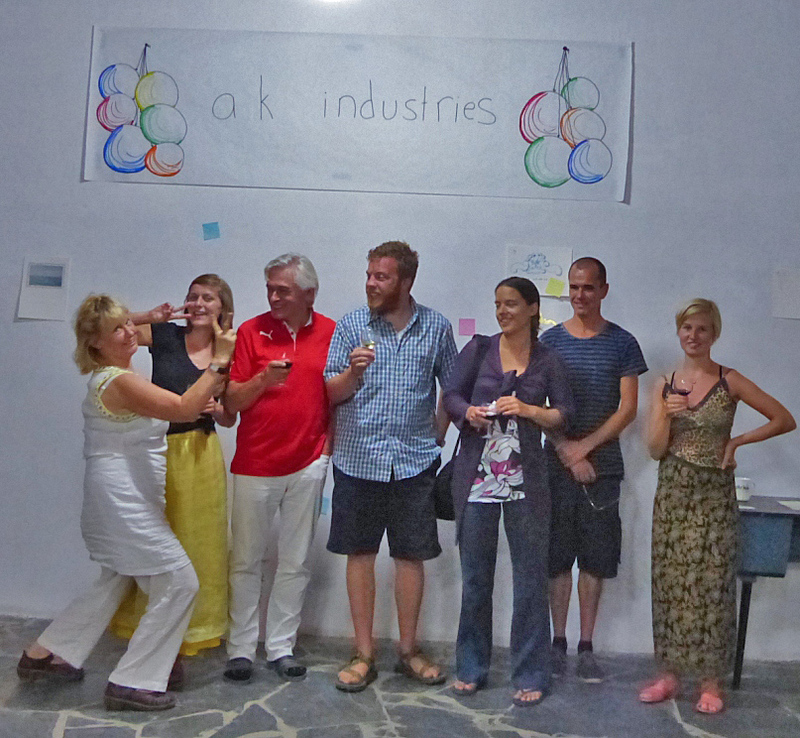 AIANDO took the visitor through a sensory experience, inspired by the landscape of the region of Alentejo. In the first floor of the castle video installations were presented showing the actors moving slowly through the landscape around the buildings of Foundation OBRAS and in an industrial landscape with marble waste. In the second floor the visitor was offered an individual experience: the visitor was blindfolded and then guided by the actors, first through a chilly breeze than into a peaceful space of gentle sounds and scents. He/she was offered food and wine and danced with one of the actors. Nuno made a video was screened on 4 November 2018 on the Video Art Zero Festival in Athens. Have a look by clicking here. The week before Nuno and Melina made another installation at the Centre of OBRAS: they created two surreal worlds in an apartment and in the patio. They assumed this to be just a warming up and showed it only to the residents. But all were highly impressed. Lisa Stegfellner (Austria) worked with cork for making bags. Being a sociologist by education she also investigated the farming and industry related to cork. Bari Kim and Namo (Korea) focus on dance performances and installations. At OBRAS they worked on their project body landscape. They investigate how to feel and express all the changes and movements in the landscape. 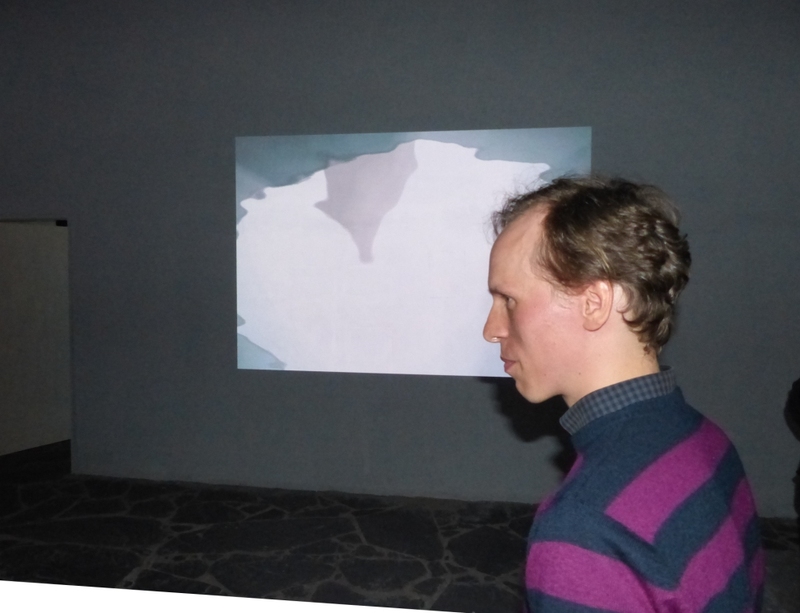 At the opening of the exhibition with Dasha Sitnikova they gave a performance entitled Poong- gyung, in which wind is a crucial element. More information will follow soon. 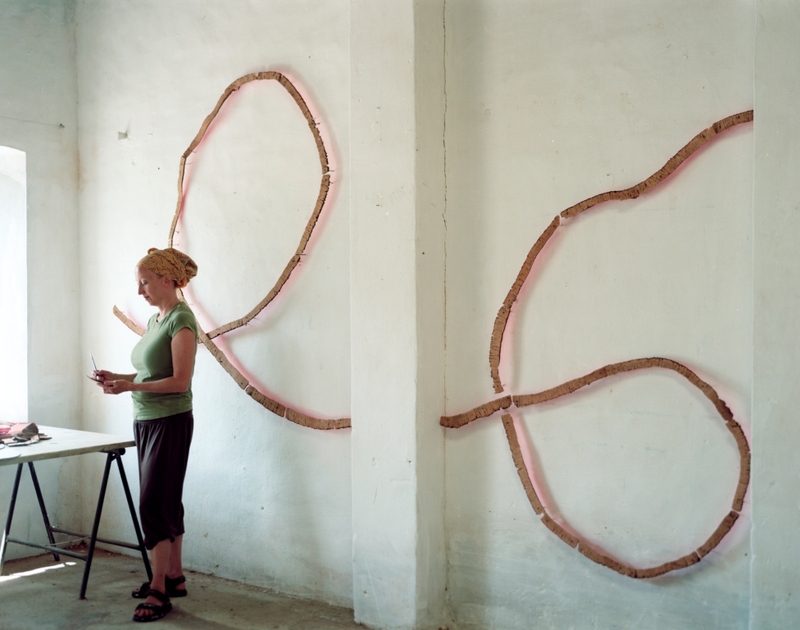 At OBRAS Holland Yelena Popova (Russia, UK) was working on “A world to gain. 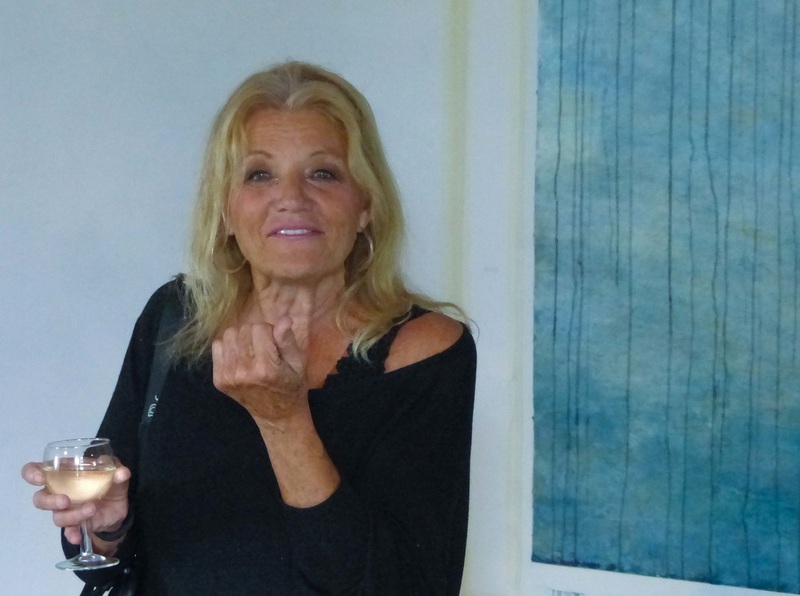 Invisible paintings”: an exhibition in the Figge von Rosen Galerie, in Köln, Germany. It will show a combination of abstract paintings and a video installation about laborers. She is also preparing herself for a commission: to create an exhibition of a private art collection from the 1930th that was donated to Upton House (National Trust). Some works has been lost and Yelena will “fill” these gaps with her “Invisible Paintings”. Sete Filhas, Sete Irmãs (seven daughters, seven sisters) was a duo-exhibition with Sally Stafford (painter, UK) and India Flint (textile artist, Australia). Sally worked on it during her residency in February and came back in May and June to continue. The artists selected seven “women of flowers”. Some are fictional while others are historical figures. Each is highlighted with a painting and a dress and accompanied with a text with historical information or a legend (for which Ben Toth (UK) did most of the research). Sally painted each of the seven in a different stile. India made seven similar dresses, all related to with one of the Seven Sisters: Georgana Molloy (1805-43). She was an early settler in Australia with a passion for botany. The dresses are dyed with Eucalyptus and Silky Oak, two Australian plant species. The scientific name of Silky Oak carries Georgiana´s name and is now common in Portuguese gardens and streets. All seven daughters are mentioned in the slide show on the right side of this page. On the inauguration of the exhibition a dance performance was given by Marcio Pereira (see video for an impression). Helen Davey, an Australian composer living in Switzerland, created a beautiful musical response on the dresses in the exhibition: sound painting 52. Yvonne Halfens (Holland) made mysterious, life size sculptures of fragmented human bodies. She experimented with first making a form with gypsum, then give it from inside a skin of transparent silicon paste and then take the gypsum off. Both the process and the final product became highly intriguing. Ingrid Simons (Holland) came back for the fifth time. 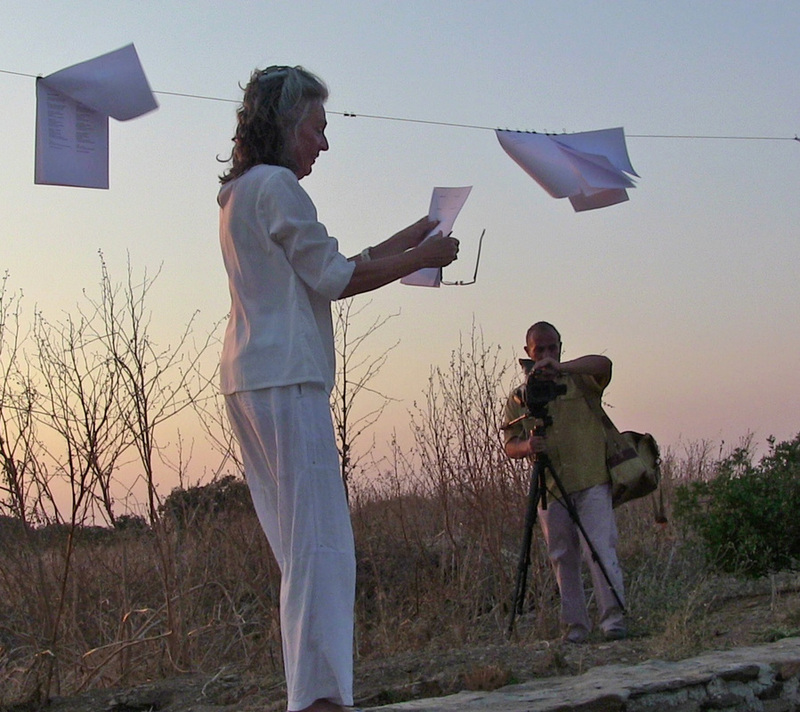 Portugal and especially Alentejo has a crucial impact on her work. Her specialty is painting landscapes: expressive, romantic and spooky in the same time. Within a week she made already three big and some ten smaller works. 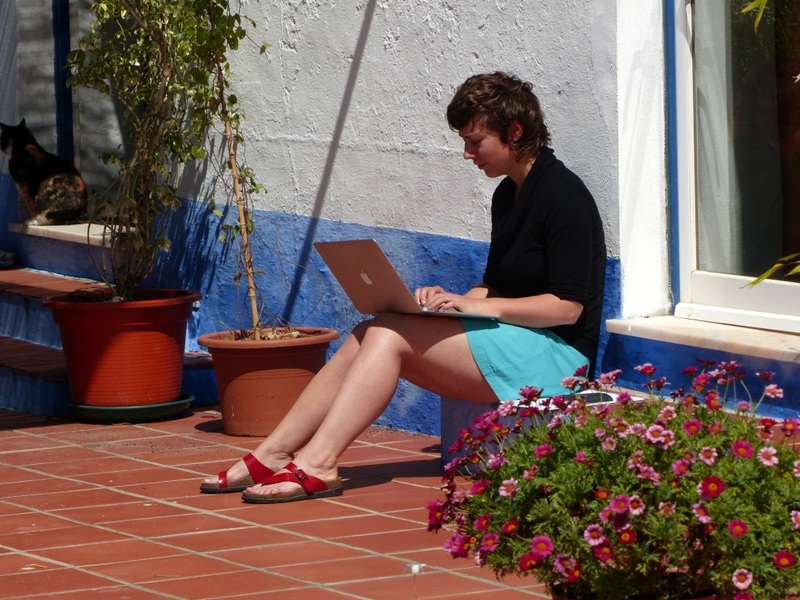 Three years ago she got inspired by the Portuguese tiles. She established a professional relation with a master potter of Redondo: she does the painting, he the baking. 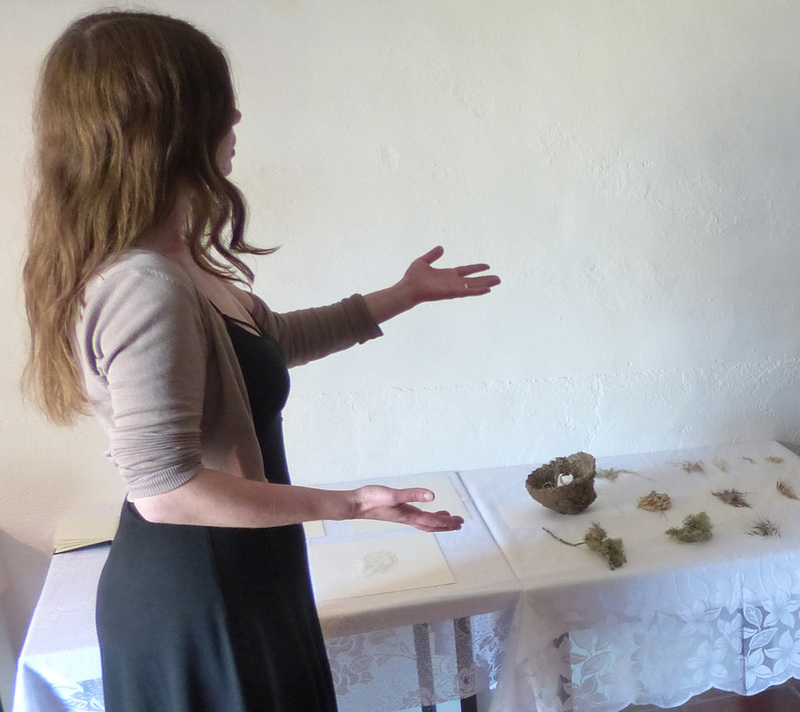 Latest news is that Ingrid got an invitation for an exhibition next year, in the ceramics gallery of Évora. At this moment in OBRAS-Holland two Australian artists have a residency: Lynne Sung (mixed media) and Diane O’Dwyer (painter). In 2012 they undertook a trip to Central Australia where the harsh dry climate and dramatic landscape informed their work for many months. This year they have come to OBRAS Holland to immerse themselves in a place of quite different geographical and physical features where water is plentiful. They respond on this experience. After a week or two of cold wet weather, Spring burst in with vigour and energy. The colours, textures and insect life became a feature of the observational drawings and sketches of the artists’ work in this period. Lynne includes materials that are sourced in the place and reflect human activity. These found materials will feature in her final works. Diane responds to what she sees by sketching in colour and working these sketches up into abstract works. Her work tends to be experimental with mixed media, printing and finally oil. 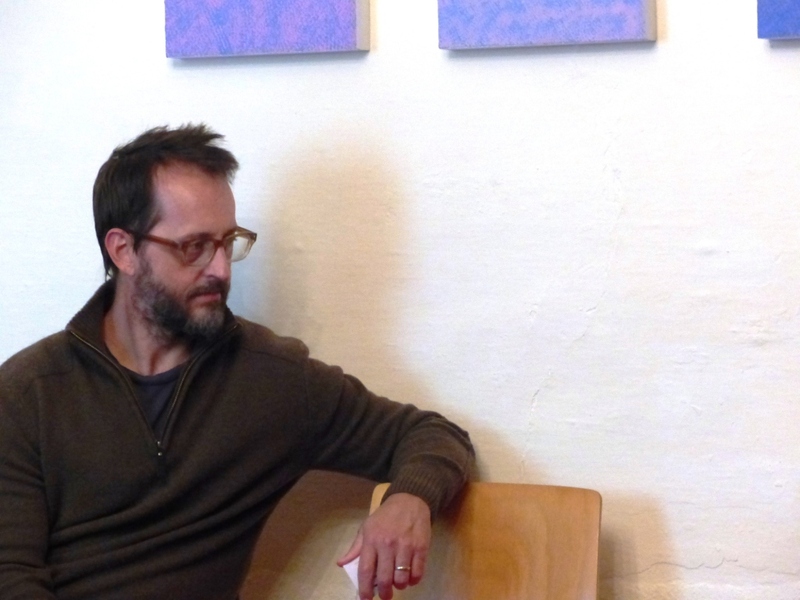 Nico Huijbregts (Holland) made a beautiful, intimate exhibition of his recent paintings. See his temporary page for more information. He also worked on his two other skills: writing and composing music. Part of the Open Studio on 25 May was an concert by Nico Huijbregts in which he improvised on the works of other participating artists. Cécile Hug (France) worked on an ongoing project: L’entre jambe, and on a new installation: The musical universe of the body. With drawings, embroidery, knitting and collage, using plants, insects and fabrics, she created a work that queries the femininity and sexuality: desire, hairiness, reproduction, proliferation, approach, encounter and sometimes rejection of manhood, androgyny. The musical universe of the body is based on the notion that when we bring our hands on our ears to be cut off from external noise, we do not dive into a empty sound, another music begins. An internal music that everyone has. Jackson Davies (Sydney, Australia) names himself an emerging artist, but his portraiture is amazingly mature, both in the artistic and technical sense. He very much prefers to work figurative, but also his experiments in an abstract direction were admired by all. Addoley Dzegede (Minnisota, USA) used the abandoned train station on a 10 minutes walk from our house as a working place. There, the last passenger took the train about 30 years ago. But Addoley gave one of the waiting rooms a makeover, using a pattern inspired by two local plant species: the stone rose and the artichoke thistle . In addition she made short movies. One: As Loucas, oucas,is on the life of ants on our terrace. It was screened on Somebodies Reality, a Short Movie Festival in St Louis (30 August 2014) and will be presented in the St. Louis Filmmakers Showcase (July 19-23 2015) and in the Cinema at City garden festival (July 2015). Addoley also tried working in marble. She dogged and polished small bowls in the stone, suggesting an application that you only can guess about. Andrea Loewenstein (USA) worked on several short stories. During her artist talk she did read one: about a young adult who discovers her lesbian sexuality. It deeply moved her audience. Andrea also made some collages of her observations of other residents. 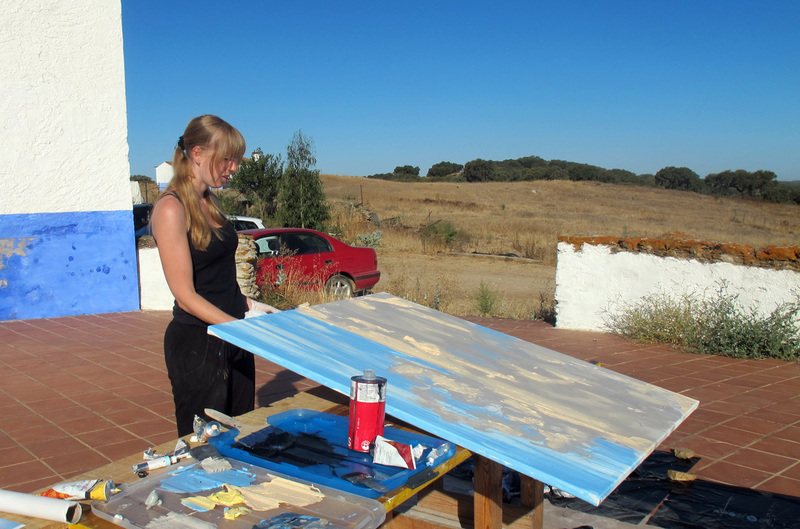 Tanya Ljubic (Australia) had a sabbatical in which she did residencies in several countries. OBRAS was the second. She made drawings and paintings on post card format, showing half-abstract scenes of urban landscapes and objects in decay. Her specific interest is in cultural imprinting: how our values and way of life are determined by nation, society and family. For this she explored traditions, embroidery, tattoo and graffiti. At home in Australia Jonathan Roson generally makes installations. Here in Portugal he took optimal profit from what he found in the surroundings. He explored marble quarries, an abandoned railway and the ruins of a water mill. He drilled nails of railway sleepers into a marble sheet and made giant calligraphies with a telephone wire that once followed the railway. His creative boost can also be seen on Jonathan´s temporary page. There is a slide show and a video clip. Norlynne Coar (USA) paints abstract landscapes in which the horizon is a symbol for the unknown and positive future. 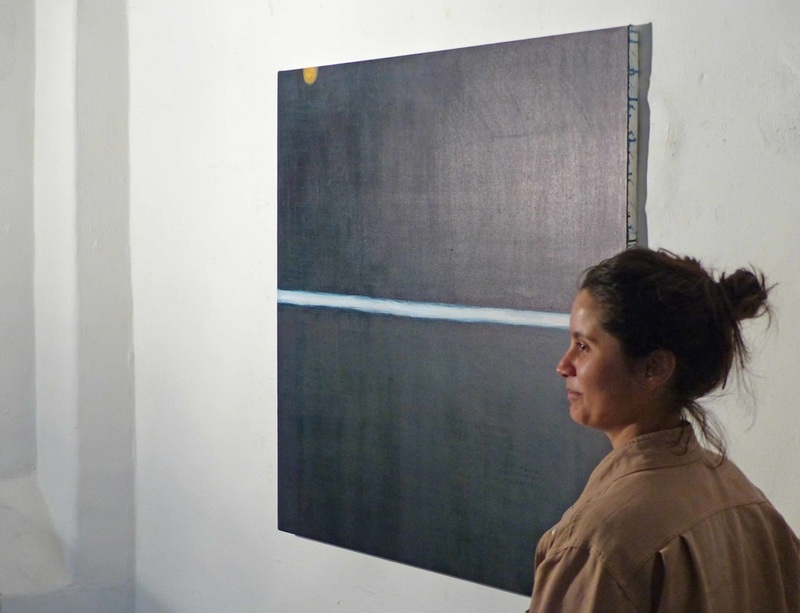 At OBRAS she used landscape paintings as studies for completely abstract work. She experimented with texture, sizes and abstraction. Her tree-scapes are getting more and more meditative. Ariella van Luyn (Australia) worked on a novel based on a true story of Lizzie O´Dea, a prostitute and petty thief in Australia in the 1920s. Ariella is a specialist in the intersection between history and fiction, a subject she recently wrote her PhD thesis about. 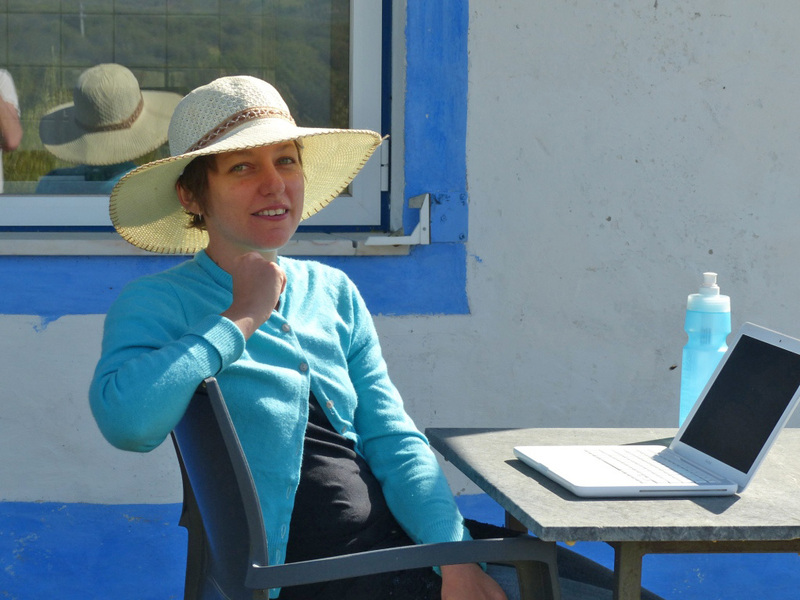 Laurence Leduc (Canada) is waiting for an opinion of her editor on her first manuscript. At this moment she experiments with a writing technique in which words and short sentences are randomly collected in the expectation that after a process of selecting, combining and deleting an indication for a story will appear. First she used her impressions of in her direct surroundings and later her thoughts and words came more from inside. She forces herself not to rush and focus, which is the opposite of her daily life in Canada. As a side project she wrote a short story. During her residency she also gave us a glimpse of her other talents: she showed to be a gifted singer and dancer. Henrik Amberla ( designer, Finland) experimented with animation. Among others he made a beautiful short clip. It is about the gently moving water surface of the swimming pool, but basically it is a kinetic abstract work. He added a surrealistic element by projecting two versions of the clip on two sides of a wall that separates two projection rooms: one version shows the bottom of the swimming pool through the water, and the version shows the sky from under water. So, the separating wall acted as the water surface. 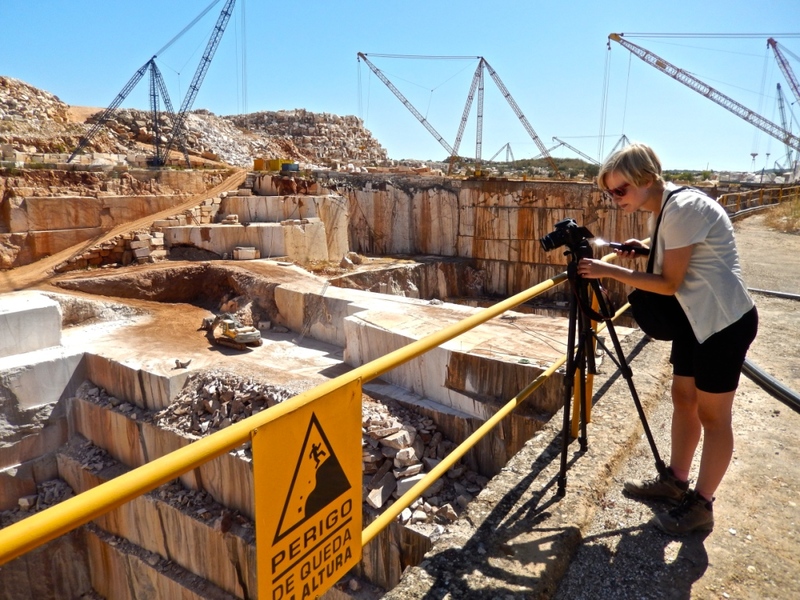 Marja Van Galen (Holland) came back, partly to edit three slide shows form other residencies and partly to continue with a project for which she collected material three years ago: making video and photo impressions of marble quarries. She struggled for three weeks and got a love-hate relation with marble. Her collages made of photo fragments of quarry walls look promising: they are a kind of geometrical abstract mosaics. Sara Pathirane (Finland) is experimenting with the principles of “Xieyi”: a drawing technique for ink on rice paper, developed in China in 2500bC and later practiced by Zen monks in Japan under the name "Sumi e": by putting stripes and dots on paper with a well chosen velocity everything can be visualized. Sara is giving this ancient technique a lively and contemporary expression by making big, colorful paintings on canvas. In her work she focuses on what is hidden in situations that seem open and exposed: a stork nest that is so visible, but what is inside?, What does that hunting cat see that we do not see? Qualia was the title of a prestigious solo exhibition with Erika Dahlen (Sweden) in Palacio de Dom Manuel (Évora, Portugal, 19 April - 18 May). The exhibition contemplates on reality and personal truth, on silence, emptiness and the value of words. Several art works are shown, including “Alentejan Writings”, a kind of giant calligraphy: 27 meters long and 4 meters high, made of cork strips and fluorescent paint. 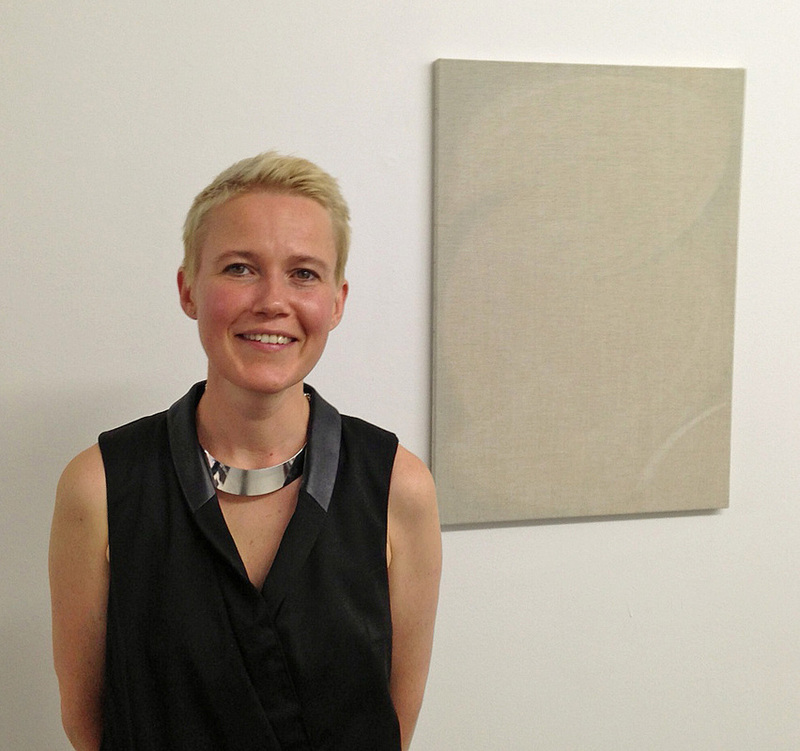 An impression of the exhibition is given in ﻿QUALIA; Erika Dahlén﻿. On the inauguration six voices recited a poem of José Rodrigues dos Santos: simultaneously, in six different languages. The poem deals with silence and with lack of communication between European cultures. During the exhibition a children’s program was organized by the Municipality of Évora. Johanna Lane (Ireland, living in USA) was working on her second novel, The Female Thing, a work of literary fiction set in New York. In addition, she worked on the editorial finishing touch of her first novel: Black Lake, which comes out in May. It tells the story of a family that has to leave their family mansion as it will be converted to a touristic attraction. But the story is also a contemplation on the Protestant minority in Ireland. Mike Harvkey (USA) worked on a new collection of short fiction. His first novel: In the Course of Human Events, will be published next April. The head character: a gentle, sometimes funny young man assists his disabled uncle. But step wise he gets in touch with extreme right wing movements. The novel shows how vulnerable we may be to brainwashing. Erdmute Blach (visual artist, Germany) returned for the third time. Portugal changed her color spectrum. 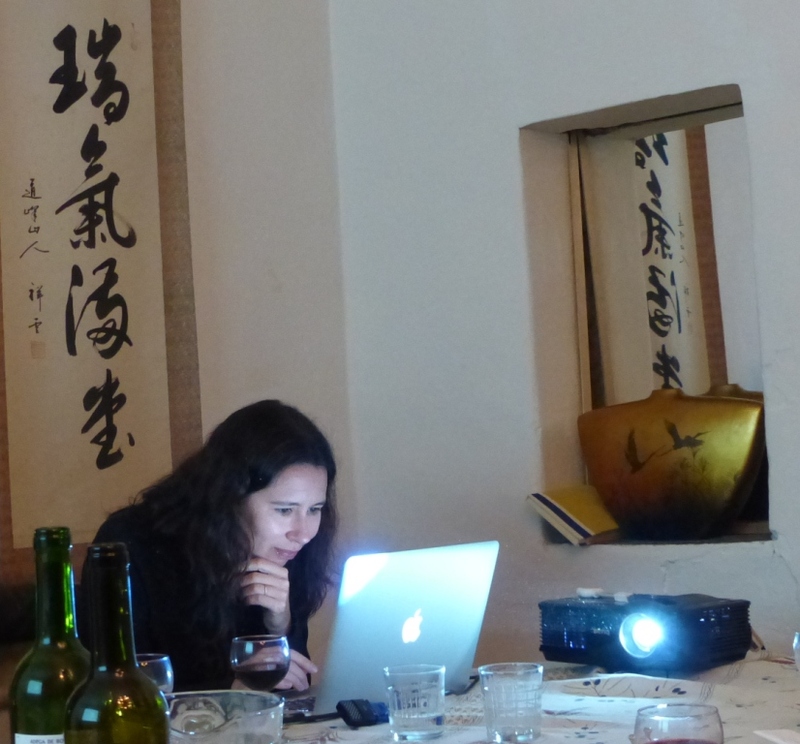 She worked on a grand exhibition in the Palacio de Dom Manuel in Evora in April 2015. 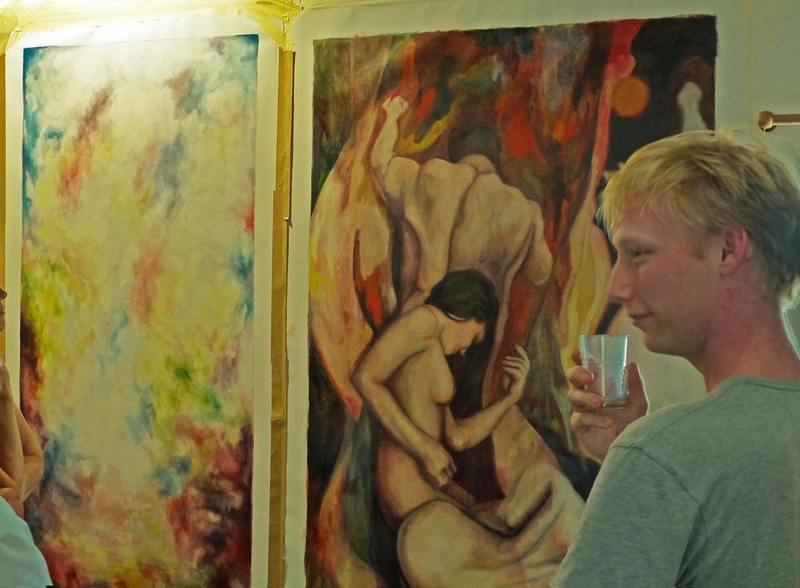 On 15-26 March 2014 she had an impressive open studio and exhibition. See her contemporary page for more information. Ank Daamen (Holland) is quite a successful emerging artist. She used her residency to contemplate on her artistic future. Meanwhile she made beautiful, half abstract tree-scapes. She saw trees as a metaphor for a place to hide. Sara Tolman (USA) made sensitive and intriguing collages for which she made her own stamps. 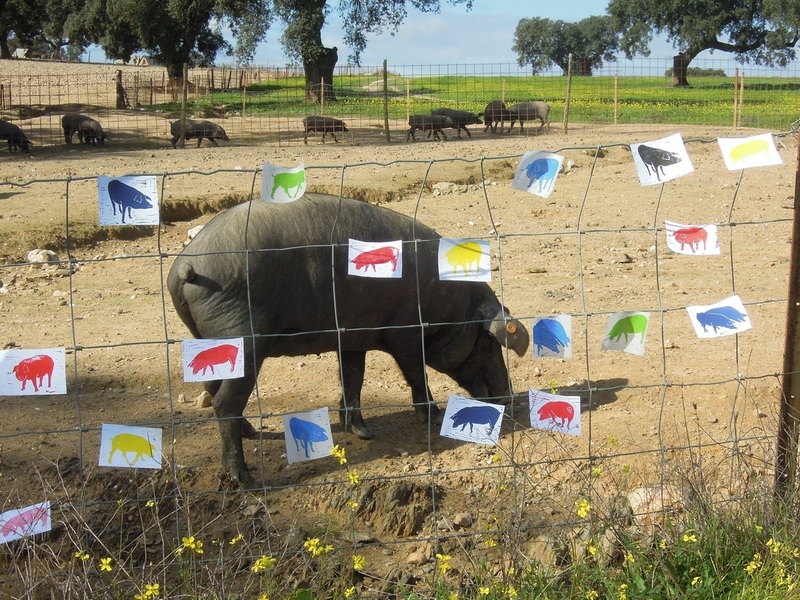 She developed a special fascination for the pigs on the other side of the valley. The interest got increasingly mutual. Jeannine Cook (USA) is a specialist in silverpoint: a graphical technique that was common in ancient times until the lead pencil was discovered. She works with it in several stiles, both abstract and figurative. At OBRAS she explored the visual quality of veins in marble sheets. Loris Button (printmaker, Australia) had a residency at OBRAS Holland. She was inspired by the surrounding lush nature and especially by emerging springtime. She started an entirely new body of work that she is now further developing at home. Gary Spearin (Canada) made large series of abstract paintings in which he used colors that he observed in the surrounding landscapes, in the sky, on buildings and in a religious procession. He presented these series in several manners: as a mural, a mosaic and in one case on the walls of Casa Miradouro (the cottage in which he lived during his residency).